For years considered the ugly stepsister of beautiful Barcelona, Madrid has finally come into its own. It has emerged as the beating heart of Spain, a beguiling city that really knows how to live. The seat of the government and monarchy, Madrid has an old-world elegance that’s reflected everywhere—from the gardens, monuments and museums to medieval mansions and royal palaces. Despite being tied to tradition, the city is brimming with cutting-edge design, fine arts and sheer energy. Its gregarious nightlife is also legendary; the innumerable bars and nightclubs enhance the appeal of after-dark Madrid.No wonder, tourists can’t afford to give this city a miss. Getting around Madrid is convenient and reasonably priced. The city sports one of the best public transportation networks in the world and the second-largest metro system in Europe. Buses and subways form an integrated network. A single ride costs €1.50 / €2, while a 10-ride ticket costs €12.20 / €18.30 (depending on the zone). To save cost, buy a 10-ride Metro-bus ticket that is valid on both metro and bus. You can also buy an unlimited travel pass for one, two, three, five or seven days. The best sightseeing option is Madrid ‘Hop-On Hop-Off-City-Tour’ bus. It operates on two separate routes, but a single ticket is valid on both routes. The tour costs €21 for one day and €25 for two days. If you’re planning to spend more than a day touring the city, buy themoney-saving Madrid card that provides free entry to over 50 museums and a variety of attractions. If you don’t want to travel by public transport, flag down taxis that are plentiful and not too expensive. Most taxi-drivers don’t speak English, so make sure to carry your destination address written in Spanish or your hotel’s business card. It would help to know a few Spanish words to indicate directions and street numbers. Renting a car isn’t recommended, since parking is a nightmare. This makes sense only if you’re planning day-trips to nearby towns. Though Madrid is considered the most expensive city in Spain, it’s cheaper for travellers than major world capitals like Paris, London or New York. You can change cash or traveller’s cheques at any bank or exchange bureau. Get your cheques in large denominations to save on per-cheque commission charges. Exchange bureaux have longer hours than those of banks, but worse rates and steeper commissions. Most major credit cards are accepted throughout Spain. Tourists should watch out for value-added tax, known as impuesto sobre el valor añadido (IVA). Hotels and restaurants charge IVA at 7%; on retail goods, it’s 16%. Visitors are entitled to a refund of the 16% IVA on purchases above €90.16 from any shop. Just ask the shop for a cash-back refund form and present it at the customs booth for reimbursement when you depart from Spain. Once you’ve figured out your mode of transport and payment, begin exploring the city’s raw, infectious energy. Few cities have an artistic pedigree as rich as Madrid’s. Masterpieces by Spanish talents such as Goya, Velázquez, El Greco,Picasso, Dalí and Miró, apart from a plethora of Flemish/Dutch (Rubens, Van Dyck, Rembrandt, Van Gogh, Bosch), Italian (Botticelli, Raphael, Caravaggio), French (Monet, Renoir, Degas) and German (Dürer, Cranach, Grien) artists adorn the city’s world-class galleries. First-time tourists must visit the ‘golden triangle’ of museums—Museo Nacional del Prado, one of the finest art museums in the world having the best collection of classical art in Madrid; Museo Thyssen-Bornemisza, housing one of the most extraordinary private collections of European art in the world from the 13th century to the present day; and Museo Nacional Centro de Arte Reina Sofía, which has a stunning collection of Spanish modern art starting from the 20th century. However, these museums are vast, so don’t visit them on the same day. Also, they offer free entry during certain times of the day, so take advantage of them on a lesser budget. 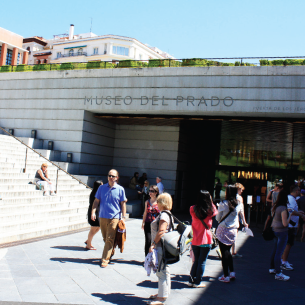 The Prado is a seemingly endless parade of over 7,000 priceless works that will seduce any art connoisseur. Though it’s impossible to see the entire collection, there are certain masterpieces you shouldn’t miss. Velázquez is the undisputed headliner of the Prado’s collection. His Las Meninas is to the Prado what Mona Lisa is to The Louvre in Paris. Also ranked among Madrid’s most emblematic paintings are Goya’s The Second of May, 1808 and The Third of May, 1808, portraying the anti-French revolt and execution of insurgents in Madrid. The museum timings are 10am-8pm (Monday to Saturday) and 10am-7pm (Sundays and public holidays). There’s free entry from 6pm-8pm (Monday to Saturday) and 5pm-7 pm (Sundays and public holidays). The entrance ticket costs €14 (general) and €23 (with visitor’s guide book). The Prado’s website offers timed-entry tickets that are cheaper than those bought over the counter. At the Thyssen-Bornemisza (entry ticket €8), begin your visit on the second floor, home to medieval art, and make your way down to modern works on the ground level. Meanwhile, the Reina Sofía’s (entry ticket €8) biggest draw is Picasso’s masterpiece Guernica—his protest against the German bombing of the Basque town of Guernica in 1937. Another eye-catching architectural innovation in Madrid is the Caixa Forum, a private museum of contemporary art and culture that seems to hover above the ground. You can’t miss the jardín colgante (hanging garden), a vertical wall of greenery almost four-storey high. Once you’ve had your fill of art and architecture, unwind at the glorious gardens of Parque del Buen Retiro. Interspersed with marble monuments, landscaped lawns and abundant greenery, it’s the perfect place for a stroll, boat ride or to nurse a cool drink. The focal point is the artificial lake, watched over by the massive Monument to King Alfonso XII. Retiro Park comes alive on weekends with street/theatre performers, live musicians, clowns, magic/puppet/dog shows, tarot card readers and hawkers. Another place to chill out is Plaza Mayor, an elegant and bustling square. Considered Madrid’s architectural jewel, it transports you back to the 17th century. It’s surrounded on three sides by ochre-hued apartments. The only break in symmetry is the Real Casa de la Panadería (Royal Bakery), decorated with colourful frescoes. Ringed with souvenir shops, cafés and restaurants, the square is packed with people, day and night. Pull up a chair (at the outdoor tables) or laze upon the cobblestones to gaze at the Spanish street life buzzing through the plaza. Then wander around Los Austrias neighbourhood teeming with tapas bars and nightclubs. A noisier gathering place is Puerta del Sol, a plaza with neo-classical buildings which is considered the heart of Madrid and one of the busiest places in the city. Indulge in the various shopping and eating joints, but watch out for pickpockets. Another tourist attraction is Plaza de Cibeles that evokes the splendour of imperial Madrid. It houses the Fountain of Cibeles, which portrays the Roman goddess of fertility sitting upon a chariot pulled by two lions. Whenever Real Madrid football club wins a match, its fans come here to celebrate. 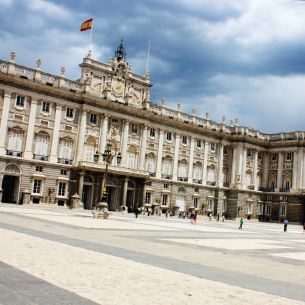 Another must-visit tourist spot is Palacio Real, one of the most emblematic and beautiful buildings in Madrid. This 18th-century royal palace is the official residence of the King of Spain, though the royal family doesn’t reside here. However, the palace is sometimes used for official ceremonies. Be prepared for a visual onslaught; the opulent interiors, architecture and artistic treasures will bombard your senses. Tour the elegant Royal Chambers, resplendent Banquet Hall, lavish Throne Room and extravagant Porcelain Room and see their exquisite tapestries, frescoes, artwork, carvings, china, silverware, etc. Also visit the Farmacia Real (Royal Pharmacy) that contains a formidable collection of medicine jars for mixing royal concoctions. Continue on to the Armería Real (Royal Armoury) which houses a hoard of medieval weapons and suits of armour. The palace timings during April-September are 9am-6pm (Monday to Saturday) and 9am-3pm (Sundays and public holidays); it closes one hour earlier from October-March. The entry ticket costs €10. For football fanatics, a tour of Santiago Bernabeu (entry ticket €19), the home of Real Madrid, is not to be missed. Circumnavigate the towering stadium and field, sit in the players’ dug-out, visit the dressing rooms, Press Room and Real Madrid Museum, take a peek at the club’s trophies /jerseys/shoes or buy Real Madrid memorabilia from the club shop. You can even get morphed photos clicked with your favourite player and purchase them as souvenirs, though they are costly (large photo €17, small photo €12). 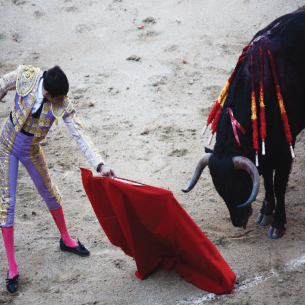 If you visit Madrid during the bull-fighting season (mid-May to October), head to Plaza de Toros Las Ventas to gain an insight into this Spanish tradition—filled with blood, courage, nobility and, sadly, cruelty. Las Ventas is one of the largest and most revered bullfighting rings in the world. Each bullfight stars three matadores and six bulls. Each matador leads a team of toreros, picadores and banderilleros. They aim to impress the crowd with daring moves which, ultimately, result in the bull being killed. Buy tickets in advance to bag good seats. Ticket prices range from €5 to €150. Madrid also offers excellent shopping and entertainment opportunities. The smartest shopping district for tourists is Sol-Salamanca, home to El Corte Inglés (Spain’s largest department store); high-street names like Zara, H&M, Mango; and top designers like Chanel, Versace, Louis Vuitton, Armani, Adolfo Domínguez, Cartier, Prada, etc. The most avant-garde part of Madrid is Fuencarral Street, lined with restaurants, shops and night clubs. The main market here is Mercado de Fuencarral. Besides selling clothes, shoes, accessories and decorative items, it hosts cultural activities like disc jockey sessions, cinema and theatre performances. Gran Via is another busy avenue that’s good for shopping, Broadway-type musicals and flamenco performances. If you’re looking for bargain deals, shop at Alcalá Street. Or head to El Rastro, Madrid’s largest Sunday flea market selling clothes, leather goods, jewellery and handicrafts. But watch your wallet! Once you’re done with sightseeing and shopping, it’s time to test Madrid’s reputation for culinary excellence. The city has embraced the innovation of Spain’s gastronomic revolution, while staying true to traditional Spanish cooking. Its residents love going out to eat and drink. Most bars and nightclubs stay open till 3am or 4am. The practice of stopping for tapas (small snack) and cana (draft beer) before dinner is an institution. The secret to enjoying a variety of tapas is to seek out the specialty of each bar, wash it down with a drink and move on to the next bar. Madrid is also teeming with delis, cafés and gastro-bars with great food and a lively atmosphere. They range from simple and reasonable to elegant and pricey. Two people can dine well for €50 or €150—or a lot less if they opt for tapas. A 10% tip for a meal is considered generous, 5% is more the norm. Finally, no trip to Madrid is complete without sampling these must-have food items—Tortilla Española (Spanish omelette made of eggs, potatoes and onions), Paella (Spain’s national dish made of rice, seafood, meat and vegetables) and Churros (Spanish doughnuts). After spending a few days here, you’ll realise that no city captures the Spanish soul as well as Madrid. Its architectural and artistic history provides a glorious backdrop to city life, while the exotic nature of bull-fights and flamenco lures tourists, time and again. So what are you waiting for? Pack your bags and head to Madrid to soak in some Spanish passion! Spring and autumn are the best seasons to visit Madrid, especially April, May, June, September and October. Cultural and street festivals are held for most of May. It’s uncomfortably warm during July-August and bitterly cold in January-February. If you’re here for the art galleries and museums, avoid Mondays—when many are closed; the Reina Sofía is an exception, closing on Tuesdays. Air: Madrid Barajas International Airport is located 13km from the city centre. It’s one of the largest airports in Europe and serviced by many airlines from Europe and beyond. The biggest airlines flying to Madrid are: Emirates, British Airways and Lufthansa. There are no direct flights between India and Madrid. Train: Renfe trains connect Madrid with destinations throughout Spain. Also, the Eurail connects Madrid with other European cities like Lisbon, Milan, Paris, etc. Madrid has two train stations—Chamartín and Atocha. Most northbound and international trains arrive and depart from Chamartín, while trains to Barcelona, Valencia and southern Spain depart from Atocha. Madrid has a large number of hotels. Staying in a luxury hotel can cost more than €200 a day; mid-range and semi-luxurious boutique hotels charge €100- €200, while budget hotels rarely cost over €60. Advance reservation is recommended. Retiro and Los Austrias are upmarket areas housing luxury hotels, while Sol and Gran Vía are best for mid-range accommodation. Malasaña and Chueca offer good budget pensiones (guest houses), while Huertas and Santa Anaareas have cheap pensiones and boutique hotels.